A forthcoming book caught my eye last month: How To Live Safely In A Science Fictional Universe, by Charles Yu. It had a slick cover, and I got my hands on a copy to review. 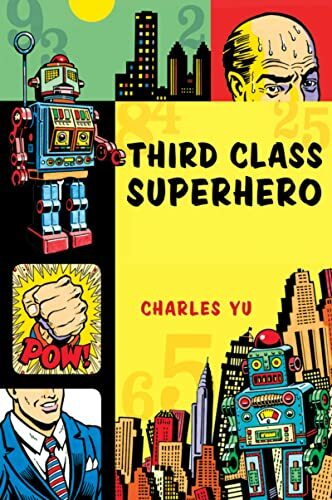 While I was waiting, I did a bit of background research on the author, coming up with only one other work to his name, Third Class Superhero, a collection of short stories. Yu, who was selected by the National Book Foundation as one of the '5 under 35' authors to watch in 2007, and seems to be a promising writer to keep an eye on, demonstrates an exceptional skill throughout Third Class Superhero. The book is a collection of eleven short stories, each of which covers a broad range of subjects, but each with a very poignant style that goes right to the heart of contemporary and speculative fiction. Reading over the book, there's clearly an edge towards speculative fiction, but if anything, it's the subtle touches and even the style of the prose that pushes the book over the genre edge, allowing Yu to tell a number of stories that are highly relatable in any setting. The title story, Third Class Superhero, is by far my favorite, one that looks to a struggling superhero, something that would fit well in the worlds created for Dr. Horrible's Sing-A-Long Blog or the UK show No Heroics. It's a story that's singularly human, demonstrating the temptations and dreams of the more average, overshadowed by others who are more skilled. A couple of other stories, such as 401k, and Man of Quiet Desperation Goes on Short Vacation look to some of the problems in a modern, commercial world, where we are so connected with everybody, but so alone at the same time. What struck me far more, however, was not necessarily the content of the stories, but the style in which they were laid out. Thinking back to the stories that I read, the only word that can adequately sum up the books is 'Surreal', something that seems to be incredibly difficult to accomplish for any writer. Moreover, where it's difficult to get subject matter across in such a fashion, the presentation itself is generally difficult to accomplish, and Yu manages to accomplish both excellently, using the stories, characters and content in most of the book to specific methods where tailored towards specific ways in which the story was written, by changing the tense and even physical appearance of the story to suit his needs. The result is content and the physical delivery of the content that go towards approaching specific themes that the writer is trying to convey to the reader. What Yu does here is what every story, (long or short) should be doing: presenting a problem, in a fictional setting, that allows for someone to relate to and examine said problem outside of the regular contexts. This way, they can come across avenues of thought that might be different with the differing contexts. Allegory comes in any number of means, and I’ve often thought that the science or speculative fiction genres offer one of the more unique ways for people to address problems that they face, either with major, global events, of intensely personal ones that they might otherwise not see an answer to. The result is a very good collection of short stories, and the praise that Yu has received for already, with only a Third Class Superhero under his belt is very noteworthy indeed. The stories themselves were very interesting - if a bit on the pretentious side of things - and go very much to the heart of critical and contemporary literature. In anything, the series of stories, plus Yu's approach to speculative fiction (subtle, pointed elements, supporting the story, rather than the other way around) leave me very excited to see what's in store for his upcoming How To Live Safely In A Science Fictional Universe in September.